DENVER, CO — What if the Earth’s ozone layer decayed? What if asteroids weren’t destroyed by outer atmosphere and impacted us on on a regular basis? And what if the Earth’s core slowed its rotation, leaving our planet completely out of sync with the gravitational pull of the moon? 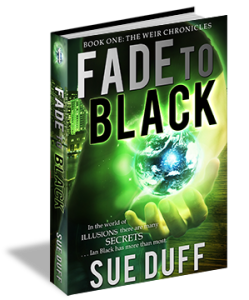 Bestselling author Sue Duff explores these terrifying questions in her latest installment of her urban fantasy series, Stack a Deck (Book Four in The Weir Chronicles). As the epic story continues, Duff’s main protagonist Ian Black learns how dangerous tyrannical ruler Aeros has become, and sees for himself the narcissist’s impact on an entire planet. Ian is forced to turn his back on the Pur Weir and align himself with the rebels to rescue Rayne. But when he travels to Earth’s alternate universe, he finds himself powerless and struggles to survive. Though, it is here that he, along with eager readers of the series, finally discover the true history of the Weir and his connection to Earth’s imminent destruction. “Stack A Deck was so challenging because I had to consider the worst future for Earth and ask the tough ‘what if’ questions,” said Duff. 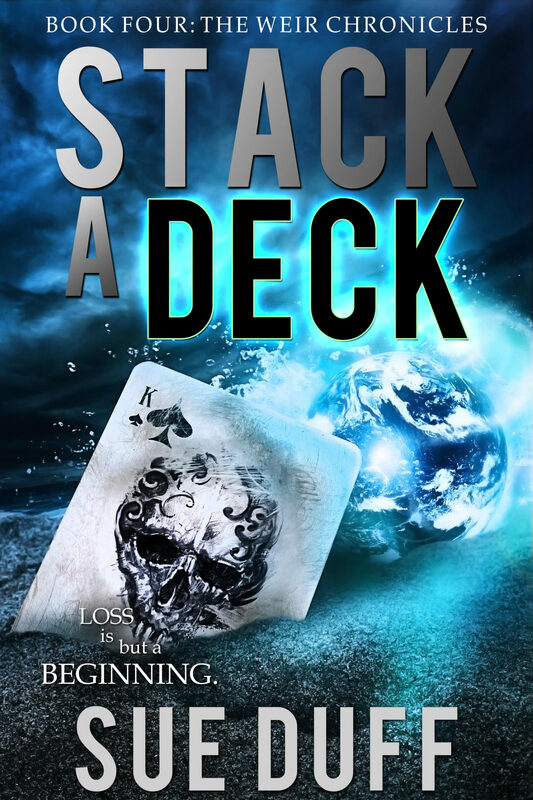 Stack a Deck is the fourth of five books in the Weir Chronicles, so fans of Duff’s novels can anticipate an exciting close in the final chapter in 2018. Out of hundreds of submissions, Duff’s novel Fade to Black placed as a finalist in the Colorado Gold Writing Contest in 2011 and in 2015, her writing earned her the PEN Award from Rocky Mountain Fiction Writers. 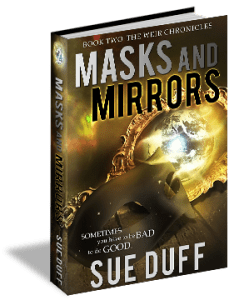 Masks and Mirrors nabbed Duff a nomination for the 2015-2016 Independent Writer of the Year from Rocky Mountain Fiction Writers, and Sleight of Hand landed on the Denver Post Bestseller list in 2016. Additionally, Duff has completed a short story entitled Duo’vr for the anthology TICK TOCK: Seven Tales of Time, which received the gold medal for Best Book Cover and silver medal for Best Anthology for the 2016 Colorado Independent Publishers Association EVVY Awards. The anthology also was nominated for Best Anthology at the 2016 UTOPIA Con. A second anthology is on its way in 2017 and, in addition to the seven Wicked Ink authors short stories, it will feature two short-stories hand-selected from over 45 submissions received from writers all over the world. Sue Duff has dreamed of dragons and spaceships before she could even read, so it’s only natural that she now combines both fantasy and science fiction as her favorite genre. Having written since high school, Duff never took it seriously until a skiing accident laid her up for an entire summer and she turned on the word processor to combat the boredom. A few years later, her first urban fantasy novel, Fade to Black, was one of five finalists in the RMFW Colorado Gold Writing Contest. 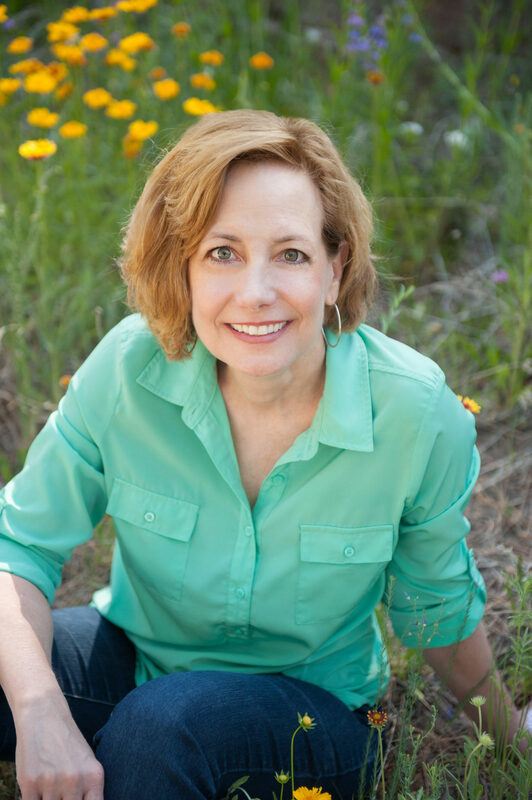 Duff’s writing has also earned her a PEN Award, a nomination for 2015-2016 RMFW Independent Writer of the Year, three consecutive years as a featured panelist at Denver ComicCon and a coveted spot on the Denver Post Bestseller list. Ian’s alliance with the rebels brings the wrath of the Pur army crashing down on them, but he is forced to abandon his new allies and travels to Earth’s alternate universe to rescue Rayne. As Ian combs the strange, desolate planet in search for her, he discovers the true story of the Weir and his connection to Earth’s imminent destruction. Catch up on the series by reading Fade to Black, Masks and Mirrors and Sleight of Hand! Love Audiobooks? You can also listen to Fade to Black through Audible. Want more? Join The Weir Chronicles Fan List for exciting news and updates on special events, giveaways and upcoming books in the series! We’re now on book four in the Weir Chronicles. Can you tell us where readers will find Ian Black in Stack a Deck? Ian has been forced to turn his back on the Pur Weir and align himself with the rebels to rescue Rayne. When he travels to Earth’s alternate universe, he finds himself powerless and struggles to survive the dangerous planet while staying one step ahead of Aeros. Since there may be some readers that haven’t yet read Fade to Black, Masks and Mirrors and Sleight of Hand, can you catch them up on what they’ve missed? In Fade to Black, the main protagonist and “superhero” is Ian Black. Born the last of the Weir, all hope rests on him to save the planet, but he doesn’t inherit the powers as predicted. Tortured in a last ditch effort to bring his supposed powers to the surface, he escapes and hides among the humans as an illusionist – until a nosy college reporter uncovers his secret. Together, they discover a malevolent Weir who is sucking Earth’s energy and depleting its resources at an alarming rate. The Weir are a race of magical beings who have served as caretakers of Earth for thousands of years and it is their connection to the planet that keeps what roams above in harmony with the energies that churn below. Unfortunately, they are becoming extinct and as a result, there is an intense rise of natural disasters across the globe. Desperate to save the earth and prevent the end of their race, the Weir turn to modern science to perpetuate themselves. But this philosophy separates their kind into two warring factions – the Pur and the Duach. To keep them from killing each other, and all but guaranteeing their extinction, a Curse is created by the Ancient counsel as a means of keeping them apart. Of course, as you could predict, the Weir soon discover it’s not wise to mess with Mother Nature! A band of rebels, committed to stopping their mutual enemy, come on the scene in Masks and Mirrors, and give Ian reason to be suspicious as he struggles to uncover what ulterior motive they have for saving Earth. 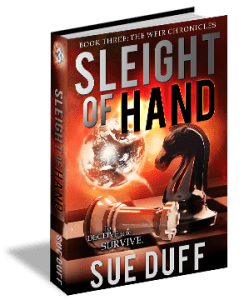 In the third book, Sleight of Hand, Ian pursues answers in order to stop Earth’s natural disasters and eminent self-destruction, but the rebels have their own agenda and poison him. Patrick and Rayne search for a cure and in so doing, Rayne ends up on Thrae, Earth’s alternate universe, while Patrick confronts the rebel leaders and learns the truth about the Weir. I write the way I like to read – short chapters that end with a cliffhanger so you can’t help but turn the page and read just ‘one more chapter.’ I’ve received feedback from individuals, who don’t typically read my genre, but end up loving my books. Others that aren’t big readers have finished my novels in one, two or three sittings! What kind of research did you have to do for your book / series? The fourth book was the most challenging of all, because I had to consider the worst future for Earth and ask the “what if” questions. What if the ozone layer decayed? What if asteroids weren’t destroyed by the outer atmosphere and impacted the early regularly? What if the Earth’s core slowed its rotation and what affect that would have on the planet and to the gravitational pull on the moon? These facts are the basis for how Aeros affected Thrae, and since it ‘used to be’ the mirror image of Earth, I had to apply those results in this novel. Do any pieces of the book come from personal experience? When I was a teenager, we took a road trip up the California Coast and spent time in the redwood forests. I thought it was the most breathtaking place on Earth, which is why I have Ian living there in my stories. What do you hope readers most get out of your book (or the series as a whole)? Regardless of the naysayers, believe in yourself and follow your own strengths and path in the world. Ian didn’t develop his powers as the prophecy predicted, and Rayne wasn’t the firstborn male Sar that her father desired. The fact that Ian turned to illusions in order to do what he couldn’t naturally (lack of powers in a magical world) is key to his character. Tortured for what he had no control over, he discovered and nurtured something that he could control. You also released TICK TOCK, an anthology with six other Colorado authors this past year. How did that come together, and do you have anything planned for 2017? Our first anthology, TICK TOCK: Seven Tales of Time, was nominated as Best Anthology of 2016 by UTOPIA Con in June, and we also won the silver medal for Best Anthology of 2016 and the gold medal for Best Book Cover through Colorado Independent Publishers Association EVVY Awards in August! Our next anthology is based on short stories inspired by our favorite song. In addition, we opened the second book up to submissions and received more than 45 from all over the world! After the marathon readings and critiques, we chose two that stood out above the rest and we’re excited to include them in the second anthology, releasing this spring. So after working both solo and in tandem with other authors on a project, do you have a favorite method of writing? There are pros to doing both! I love my Wicked Ink team and we do so much to support each other. It can be daunting to self-publish a novel, but with having a team, the burden can be shared by all – which makes it easier. But…I also love writing on my own, because the final decisions and content are solely mine and I don’t feel so stressed by deadlines – albeit the ones I put on myself. But truly, I have the best of both worlds! I was born in Chicago, IL, but my family moved to Phoenix, AZ when I was four years old. I grew up there until I went to Flagstaff, AZ and attended Northern Arizona University, majoring in Speech-Language Pathology and Audiology. I soon moved to Denver, CO to earn my master degree at the University of Denver in Speech-Language Pathology. I worked at Porter-Littleton Hospital for ten years, then worked at Denver Public Schools where I am currently servicing elementary school children. I had a skiing accident and after my surgery, I was laid up for an entire summer. I was going stir crazy and decided to turn on the word processor to revisit some of my love of writing stories. It didn’t take long for me to develop an idea and found myself plotting out a story that took on a life of its own. By the time I finished the first draft, I was hooked, took a creative writing course, and everything exploded from there! That’s hard to answer because I like to think that they develop themselves. I get an idea, or take a piece of my own personality, give them a rocky backstory (we all have one) and before I know it, they take on a life of their own. I’m sure I use pieces of people I’ve known over the years, or people that intrigue me, but I honestly don’t use anyone I’ve actually known, verbatim (wink). Boredom, a need to distract myself. I had a lot happen to me over about a decade and for the first time in my life, I felt I wasn’t in control of anything. Writing, creating worlds and characters, etc. helped me to feel in control. It was better than therapy! Absolute quiet! I am easily distracted by sounds like music. I do love my Diet Pepsi, probably because of the caffeine but I’m trying to drink more water, too. I used to go for hours without eating while I was writing, but the older I get, that’s not the case and I have to have some kind of snack. I’m big on fruit, but it’s not unusual that I have unhealthy tidbits within reach. LOL, this is a running joke among my writer friends. I get most of them when I sleep. I rarely remember my dreams, never have, but when I’m in the “writer zone” I actually wake up knowing how a difficult scene from the night before is going to work, or have a delightful character show up on my pages! I am still partial to mysteries, detective novels, science fiction and always fantasy. About the only genre I’ve never gotten into is romance. I’ve read some, but they feel too formulaic for me and after a few, I’m just not intrigued by them anymore. What would your advice be for authors or aspiring authors in regards to writing? Write what you love! It will show in your world building, characters and story-line. If you don’t love it, it will come across in your world building, characters and story-line. Find a critique group that will be supportive, but honest with you. They are out there, and if you aren’t comfortable with one, keep looking, they are all over metropolitan areas and hundreds are online, too. Be supportive of anyone who is writing! It is a scary thing to bare your ideas, thoughts and soul into a story. They need encouragement. Every successful author started the same way.